In the middle of last season, Jong Dae Se left for Shimizu S Pulse. Why anyone would move from the 2nd place team in Korea to a relegation team threatened J League team (aside from money I guess) beats me but he did (and Shimizu DID end up relegated). But anyway, this left Suwon in a pretty bad position of not really having a striker. They played Seo Jung Jin up top, then signed a new Brazilian striker named Hygor this winter, but it wasn’t all too satisfactory. Now, Suwon also had a certain young striker by the name of Kim Gun Hee who had gone through the Maetan high school system but instead of signing for Suwon, opted to attend 고려대 (Korea University) for two seasons (2014 and 2015). Kim Gun Hee was an absolute star with the Koryeo team, and for those of you who remember, was easily our best player at the ill-fated 2014 U19 AFC Championship alongside Seo Myung Won. But for ____ reasons, he opted to not go pro yet. And even the man himself admitted that he was worried if he had gone pro too late. In interviews, he reports being acutely aware that fans were worried about that. But I believed his patience fortuitously paid off (details to come). Why? Because now, Kim Gun Hee is lined up to be the starting Suwon striker. And he HAS to play well if Suwon are to be as successful as they were last season. Read on for a preview of Kim Gun Hee’s history and his upcoming season! Lemme say this flat out: Kim Gun Hee is a beast. He’s a player I was aware of since his Maetan high school days and he was GOOD. He played for Maetan (Suwon’s academy) from 2011 – 2013, and caught the eye of us fans even back then, as he won a couple of awards and was on good scoring form as well. It must be said, though, this may be due to the fact that someone on Youtube may or may not be a little obsessed with the guy. 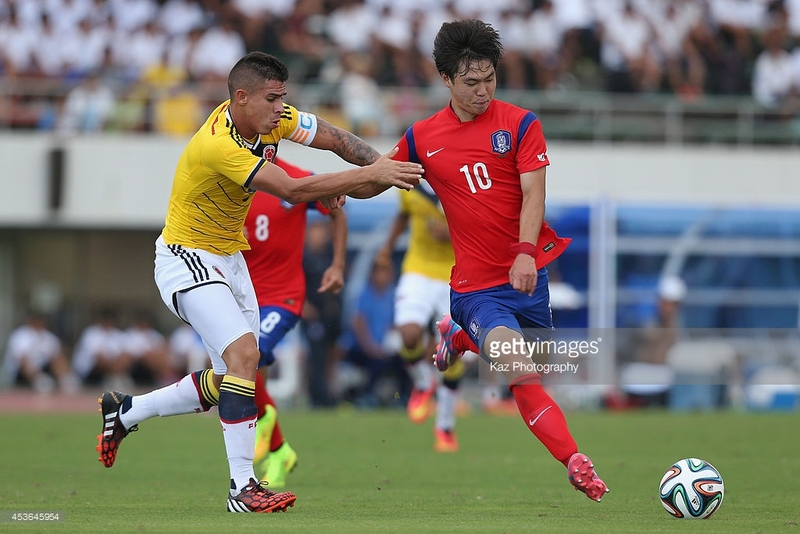 Even early on, Kim Gun Hee stood out for his 1) height 2) physicality, and above all, 3) speed/dribbling. Certainly a special player in the HS ranks back in the day. Then he signed for Korea University for the 2014 season, and while there are a quite a few videos of him floating around on the U League Facebook page (you guys gotta like that page, it posts highlights from the Korean University teams), there’s only 1 (unimpressive) vid on YT. At his time at Korea University he did manage some small awards in small tournaments, but the team never really played THAT well, and Kim Gun Hee never acheived Top Scorer or MVP with KU in the U League (Son Joon Ho of Pohang got MVP 2014, Kim Min Hyeok of Kwangun University got MVP 2015). But he still had a good goalscoring record that established him as one of the best U League players. ^This (추계대학축구연맹전) is one of the tournaments that KU won and KGH got top scorer in. I think Kim Gun Hee really rose to fame during the 2014 AFC U19 Championship. An article says he was involved with the U17 setup in 2012 (which I don’t remember, and he was too old for the 2012 U16 Championship where HHC carried the team but lost on PKs eliminating us from WC contention). But at the 2014 Championship, KGH was THE boss: as the starting striker for all three ill fated games, KGH scored 2 against Vietnam and 1 vs Japan. Now the U19 Championship is a source of heartbreak for most of us because that team was unbelieveably talented. Most of the blame appropriately falls upon the manager for some odd player selection and horrific rotation skills (who the f*** plays almost identical lineups for three games over 5 days? ), but it is arguably true that the only players who really showed up to the occasion were Kim Gun Hee and Seo Myung Won (Hwang HC came back from injury, Paik Seung Ho was not given enough PT). For the upcoming K League, Suwon will absolutely depend on Kim Gun Hee to provide some goals – Santos, Kwon CH, and Yeom KH will surely chip in (and likely outscore KGH) – but unless KGH’s on form they won’t play to their best either. Now, KGH came straight out of university and is only 21 years old, so don’t expect him to light up the K League with 15+ goals, but I think 10 would be a good expectation for him. Overall, perhaps it’s a good thing he signed so late – had he signed last year, he would have lost a lot of playing time – while he was the star man at KU, he would have surely been benched last season, probably even after Jung Tae Se left. By delaying entrance I guess he got the chance to really nail down his basics – it might not have been the most competitive league for him but hey playing time is absolutely essential at the age of 19/20 right? Kim Gun Hee is an exciting prospect because in my eyes, he’s every bit as talented as Hwang Hee Chan. They are fairly similar players but also offer something different – KGH is taller and from what we’ve seen in the U League is a good aerial threat, while Hwang HC seems to have somewhat better (again, I can’t really compare because they play in different environments and have never really played together) dribbling ability. Either way, when it comes to center forwards these two players are certainly the top prospects Korea has to offer.